Antique 19th century Dutch painting. 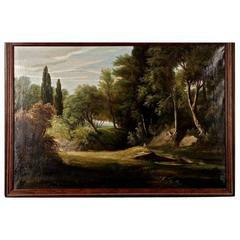 Framework oil on canvas depicting a pleasant Nordic landscape with animals of good pictorial quality. Framework of good measure and impact for antique dealers and collectors of Flemish painting. Frame from 20th century carved in oak wood, of beautiful decoration. Painting that has undergone a conservative restoration during 20th century. In good state of conservation with some sign of the time. Sight size: H 64 x W 82 cm. In good state of conservation with some sign of the time. A very large 19th century oil on canvas painting. La Grand of fruits. 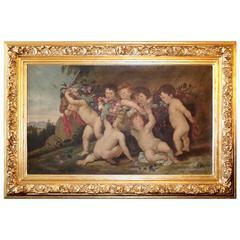 After Sir Peter Rubens Frans Snyder's 24-karat hand gilded carved frame. 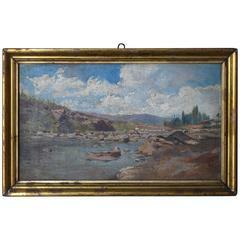 A delightful and very charming later 19th century oil on canvas landscape painting of the Spanish country side. Wonderful brush work. Housed in a handsome giltwood frame. Beautiful oil painting from Denmark, unknown artist, original frame. Pair of 18th century marines depicting two period boats in Hong Kong's harbour. Measurements of painting: 27 x 19.5 cm. 19th century oil painting on canvas, depicting landscape with deck and house with smoking chimney, measure without frame 90 x 45 cm.